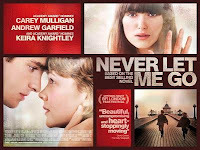 Andrew Garfield stars in another riveting performance in “Never Let Me Go” with Carey Mulligan and Keira Knightley. Based on the novel by Kazuo Ishiguro, the movie centers on love and betrayal among childhood friends Kathy (Carey Mulligan), Tommy (Andrew Garfield) and Ruth (Keira Knightley). The three are students at Hailsham, a very exclusive and very strange English private school. As children, the three spend their childhood at a seemingly idyllic English boarding school. Tommy is an isolated boy who struggles creatively and is often the target of bullies. As they grow into young adults, they find that they have to come to terms with the strength of the love they feel for each other, while preparing themselves for the haunting reality that awaits them. You can read more about "Never Let Me Go" and you can see the trailer too after the jump. Garfield’s performance in the film has earned him multiple wins including a Breakthrough Actor Awards in Hollywood Awards, Supporting Actor (runner-up) in the Boston Film Critics Award and Ensemble Performance in Palm Springs Film Fest. The film’s message and themes were the factors were the factors that made Garfield take the role of Tommy. “Never Let Me Go” is from 20th Century Fox to be distributed by Warner Bros. exclusively in Ayala Cinemas starting March 2, 2011. Check out www.sureseats.com for the movie’s schedule.